Last Sunday I was lucky enough to see one of my favourite people in the world for the first time in almost two years at a 5,000 capacity venue in Hammersmith, London. It was certainly an experience I will never forget and which completely blew me away in every sense of the phrase. On Sunday morning, my mum and I headed to London on the train and arrived at Euston at about 1:30pm. After navigating our way through two tubes, admittedly with a little help and a few wrong turns, we made it to our hotel and, no surprise, I was absolutely buzzing with excitement. As you probably know, Harry is one of my favourite people in the world. With absolutely no exaggeration. I have loved him ever since I laid eyes on him, as cliché as it sounds, and over those seven years I’ve been lucky enough to have grown up with him and watched him grow in success, confidence and everything in between. So the prospect that I was about to see the person who makes me the happiest in the world in such a small venue after almost two years left me shaking as I sat down and had a pre-show cup of tea in the Holiday Inn. I got ready and we headed down to check out the venue at around 4:30pm, where the queue was already absolutely massive as people had been camping overnight for almost a week! I met up with a few friends outside and had a catch-up which was really nice, and then I decided to buy some merchandise before the show. The pop-up merchandise shop was open outside the venue from 12-6pm on the day which was such a good idea as it saved the huge crowds inside which usually end up in me not being bothered to get merchandise at all. After a lovely dinner at Bill’s, we went to join the queue at about 6pm. As expected, it was already halfway down the street next to the venue when we got there, and it was absolutely freezing. It did make me wonder how those girls had camped out for almost a week when it felt like my fingers were going to fall off after just an hour of standing there! When we finally got inside, I was amazed by how small the venue really was. Anywhere you stood had a really clear view and the floor was sloped towards the back and edges so that you could pretty much see from anywhere! I was amazed by this as being only 5’1 I’m nearly always peeking in between peoples’ heads to see at standing shows, but this floor was the best invention I think I’ve ever seen! We decided to stand right at the side where the floor sloped and to my surprise we weren’t even that far away considering we’d only queued for an hour or so! As the venue started to fill up, we had to shuffle around a bit to make sure we could still see and apart from a few annoyingly tall people and some people who kept moving around, *ugh*, our view was still pretty good when the support act, MUNA, came on. I’d never heard of them before Harry announced them as his support act but they were really good and got the crowd hyped for Harry. I always complain about how boring support acts usually are but MUNA had a lot of energy, their music was fun and different and I actually really enjoyed their set. A pink flowery curtain fell shortly after MUNA left the stage and that’s when the reality hit me that I was about to see Harry. There’s nothing like the anticipation before one of your favourite artists is about to come on the stage and you know you’re about to have one of the best nights of your life. After about half an hour, the lights went down and the excited screams erupted as Harry’s band started playing the opening to the first song, ‘Ever Since New York’. They started singing ‘tell me something I don’t already know’, part of the song over and over again getting louder and louder until Harry’s silhouette appeared on the curtain and then it dropped to reveal the man himself standing there with his guitar. Oh, and he was wearing the prettiest floral blue suit I have ever seen in my life. I thought this was such an exciting and dramatic entrance and a great way to build the anticipation at the start of the show. Harry welcomed us after singing the first song and made me feel so at home by saying ‘feel free to be whoever it is you want to be in this room’, something he says at the start of all his shows as the theme of love and acceptance for whoever you may be is part of his ‘treat people with kindness’ motto. One of the many things I love about Harry is his personality and that certainly shone through during the show. He was constantly interacting with the crowd, cracking jokes and just generally being really charming and funny. Someone in the front row told him that they’d been camping for six days, and he jokingly said ‘you did know the show was on Sunday, didn’t you?!’. Then he asked us to put our hands up if we’d camped, then hands up if we hadn’t, by which we were responded to with a ‘shame on you!’. Little things like this make the show so interactive and personal and I really just felt like I was seeing an old friend who really put me at ease and made me feel so happy and at home in that room. Harry was also really appreciative of us all being there, he kept thanking us for coming despite the fact that he only had 10 songs out. He played the entire album, which was magical because usually artists don’t have time to play every single track and end up missing out a few of your favourites. But because this was Harry’s first solo album, he got to play every song which made me very happy. However, one of the highlights for me was the part of the show when he sang three covers in a row. He sang one of my favourite ever songs, ‘Just a Little Bit of your Heart’ by Ariana Grande which he wrote for her a few years ago. It’s such a beautiful, heartfelt song and to hear him sing it live with his own spin on it was really special and I’ve got to be honest, I did almost shed a bit of a tear. Another heart-warming moment was when he stopped the song the first time because he saw a fan who was ill in the crowd and just stopped everything to get the security and those around her to help her. This happened a few times during the show, and it made me so proud to be a fan of someone who cares about us so much that he’d literally stop what he was doing just to help them out. He then introduced ‘Stockholm Syndrome’, a One Direction song, by saying that we may have heard him sing it with his ‘wonderful friends’ a few years ago. This obviously made my heart swell up with nostalgia because as you know I absolutely adore One Direction and to hear him sing it live brought back so many memories. The crowd is always the loudest when any of the boys sing a song from the band. After that, he said ‘you better know the words to this one!’ and he sang One Direction’s first ever song, ‘What Makes You Beautiful’, which really made the crowd go wild. That song is where it all started for the band and has so many happy memories attached to it for me, and even though Harry did it in his own unique way it was just as amazing as every other time I’ve heard it live. I think I almost lost my voice singing along to it, and even my mum was shouting the words! Another highlight was the infamous ‘Kiwi’, a song which is notorious for making the crowd go absolutely insane. After experiencing it live, I can confirm that it was one of the craziest moments of my life. It’s such a rock-y influenced song and I jam so hard to it in my bedroom alone, so you can imagine a crowd just going absolutely mental to it live. I swear I didn’t breathe properly throughout the entire song and could literally feel my voice breaking while screaming along. After the craziness of ‘Kiwi’, Harry went offstage and after a few minutes came back for the encore where he toned it down a bit and sang the solemn ‘From The Dining Table’, before singing one of the most iconic covers ever of ‘The Chain’ by Fleetwood Mac. It is one of the most legendary songs ever yet Harry managed to put his own stamp on it and honestly it was one of the most amazing things to ever have graced my ears. As has become a tradition during Harry’s tour, once ‘The Chain’ was finished, the crowd started chanting ‘KIWI’ over and over again until Harry started singing it again. Like the tease he is, he stopped and said that we needed to be louder if he was going to play it again, and that he would do it 20 times if he had to in order to get it right! So as if the first time wasn’t crazy enough, I screamed and danced and felt my voice break AGAIN. But it was so worth it. Harry fittingly finished off the show with the single that started his solo career, ‘Sign of the Times’. This song means such a lot to me and admittedly I did feel my lip quivering and had a lump in my throat as I sang along. Looking around the crowd I saw flashlights and loads of tiny pride flags waving slowly to the rhythm of the song and felt so safe and at home in that moment. It was such a good song to end on because it just summed up the entire show; feeling safe, being whoever you want to be and feeling like nothing else in the world mattered because I was back with my favourite person, as cliché as it sounds. 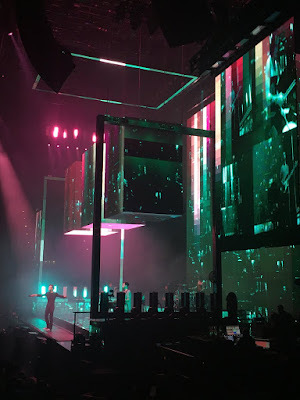 Harry’s vocals throughout the show were absolutely incredible; he hit all the high notes and put a unique twist on most of the songs from the album versions which I loved. His energy on stage is amazing to watch – he skipped around with a massive pride flag, made us hug a random stranger in the crowd shouting ‘EMBRACE’, took someone’s tinsel and wore it round his neck like a feather boa and told us how happy he was that the crowd was so colourful. Not only is Harry an amazing singer, he’s a true performer and you can tell that his songs mean so much to him. He owns the stage and his shows are a fun and safe place to be. His personality shines through, he adores his fans and works the crowd so well, and that’s why I’m proud to say he’s one of my favourite people in the world even after seven years. Have you been to any of Harry’s shows or are you going to any next year? I’d love to hear from you in the comments! Also, apologies for disappearing for so long, I’ve been so bad at posting recently! As you probably know I started my Masters in September and I’ve just been so busy since then, but hopefully I’ll have more posts for you guys soon.